Over the past few days, there have been several offers out there for free points and cashback for certain members or cardholders. I figured I would put together a quick post that summarizes each offer in one post. 1) $15 Statement Credit for Chase Sapphire & Chase Sapphire Preferred Cardholders – Through 9/30/15, Sapphire or Sapphire Preferred cardholders who make a purchase using Visa Checkout at a participating merchant with their respective card will receive a $15 statement credit within 1-2 billing cycles. There is a limit of one $15 statement credit per account (unlike the recent American Express offer which was a statement credit for each merchant and thus you could earn multiple statements credit per account). Some of the participating merchants include Newegg, Fandango, UnderArmour, Pizza Hut, Staples and more. Since the terms do not indicate a maximum purchase, you could purchase a cheap $.49 cent game code from Newegg using Visa Checkout to make a profit of $14.51 which is exactly what I did. Of course you could also buy something you need from a participating merchant and use this to take $15 off the purchase. Just remember to take advantage of this before 9/30/15! 2) 500 Free IHG Points – IHG is offering members 500 free IHG points if you link your IHG Rewards credit card to your online profile by October 31st. This might be targeted (though the terms don’t explicitly state that) as several people received an email about this offer but I think it is worth a shot to try it anyway. Worst case you don’t earn anything while best case you earn 500 points for linking your IHG MasterCard to your profile. The terms also state if you already have your IHG card linked you would receive the bonus points (again assuming this is not targeted) so no need to unlink it and relink it. While 500 points isn’t a lot, it will reset the expiration of your points. 3) 200 Free Starwood Starpoints – Starwood is promoting the use of their SPG Dashboard which is an online tool that tracks all your historical stays, summarizes your account activity and offers exclusive promotions when using the SPG Dashboard. When logging into the SPG Dashboard, most people are reporting seeing an offer for 200 free points if you opt in to receive emails from Starwood. If you don’t see this offer displayed, check your SPG profile and see if you are already subscribed to receive emails from Starwood. 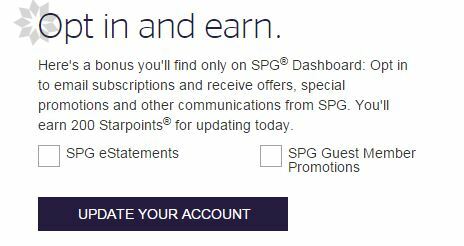 If so uncheck all the boxes to unsubscribe, sign back into the SPG Dashboard and you should then see the offer appear for 200 free points. I did exactly this for my account and it worked. As with the IHG offer, 200 points isn’t much but does serve as a great way to extend the life of your points. I’m sure there is a limited target audience for this deal but United is offering 25,000 miles to members who purchase a Certified Pre-Owned Mercedes-Benz and if you are a United elite member, you are also entitled to special discount pricing on certain models. In order to take advantage of this offer, you must first register and obtain a control number to present to the participating Mercedes-Benz dealership. For this promotion, United is partnering with TrueCar to find available models near your neighborhood. You can view the prices on each car but since I’m not in the market to buy a Mercedes, I can’t express any opinion whether these prices seem fair or not (though if I had to guess they are probably high). To obtain the 25,000 miles, you must print out the savings certificate with your control number (see below). While it would be nice to earn 25,000 miles for buying a car, remember these miles are roughly worth $300-$350 depending on how you value them so when considering the price of a Mercedes, this is not a significant incentive. You are probably better off researching and finding a good deal on a Mercedes yourself though it may be worth a shot to see how much you can negotiate on a car you find using United’s TrueCar link. The bonus mileage offer and incentives are only available to members who are eligible MileagePlus members at the time of an eligible transaction. 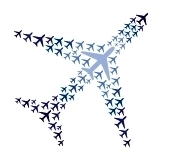 An eligible MileagePlus member is a member who has been enrolled in the MileagePlus program for at least six (6) months prior to the time of accessing the bonus mileage offer and incentives, or if less than six (6) months, has flown at least one (1) flight eligible to earn miles since enrollment. 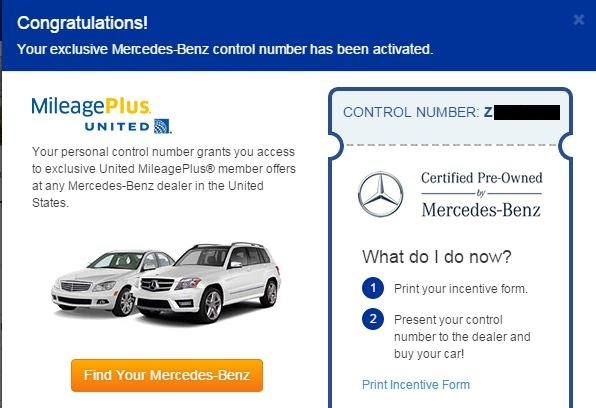 To receive the miles or incentives, the MileagePlus member must log in to united.com/mercedes using their MileagePlus credentials and print out a Savings Certificate to present to the dealer for the applicable car of their choice. In order to be eligible for the bonus mileage offer or other incentives, the member must obtain a Savings Certificate prior to the transaction. Upon completion of the sale or lease, these bonus miles will be posted to a member’s account approximately 6-8 weeks after the date of completion of the eligible transaction. These offers are not valid for any purchases already completed. 1. Extra 20% Bonus for Starwood Transfers to American Airlines – Expires 8/31 – The standard deal is if you transfer Starpoints in 20,000 point increments to American Airlines, you would receive 25,000 miles. However you can receive 30,000 miles if you initiate the transfer today due to the 20% bonus being offer. This promotion has already been extended once and I wouldn’t bank on it happening again. If you are short on AA miles, this is a great way to top off your account for an award. 2. 80,000 Point Offer on the Chase Marriott Credit Card – Expires 8/31 – I haven’t posted separately about this offer because I’m not the biggest fan of Marriott but for those looking for Marriott points, the 80,000 point offer with the $85 annual fee expires today. To be honest, I think I actually prefer the 70,000 point offer as the annual fee is waived AND you get a free night at a category 1-4 hotel upon approval. Personally I’d skip this offer and wait for the 70k offer as mentioned. 3. Last Chance to Redeem American Airlines AAdvantage Miles for Travel on Hawaiian Airlines – Expires 8/31 – Starting on 9/1, you will no longer be able to book Hawaiian Airlines flights between the mainland US and Hawaii with AA miles. This is a bit of a bummer as you generally could find better award availability on Hawaiian than the legacy carriers and the in-flight experience on Hawaiian is a bit nicer with free meals and generally better service. One important item to note is you can include Hawaiian Airlines flights intra-island in Hawaii on an AA award still after 9/1. A routing of LAX-HNL (on American) followed by HNL-OGG (on Hawaiian) is still allowed. 4. 3,000 Miles for Playing a Single Round of Golf – Expires 9/1 – I posted about this last week but for a limited time you can earn 3,000 American Airlines miles for signing up and playing a single round of golf with Golfmiles. In order to receive this special promotion, you must signup via my referral link as I negotiated this offer for PointsCentric readers only – no other blogger or website has this offer. If you don’t signup by 9/1, you can still earn 2,500 miles in any program (not limited to AA) if you signup and book a round by 9/10. 5. 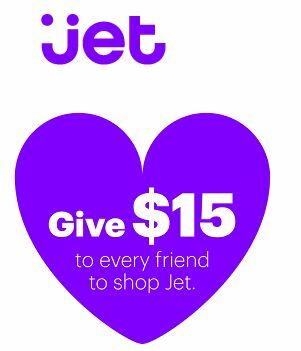 $15 Off Your 1st Order of $50+ at Jet.com – Expires 9/1 – I was an early adopter of Jet.com before it was open to the public and I have found it very comparable to Amazon with similar (or lower) prices though with not as big a selection as Amazon. If you are new to Jet.com and spend $50+ on your first offer, you can take $15 off your order with promo code “4697F34“. Please note this is my referral code and I will earn $15 off my next purchase as well. This is the best public offer I am aware of – if you have a similar referral code, feel free to post it in the comments. Last month I broke the news to the points & miles world about Golfmiles, a website golfers could use to book tee times and earn thousands of miles for playing golf. I was able to my offer my readers an exclusive bonus of 1,500 miles at that time but I’m happy to report I have negotiated an even higher bonus mile offer of 2,500 miles. And if you choose to earn AA miles, this offer is increased to 3,000 miles! This is the highest ever bonus mile offer from Golfmiles and this is an exclusive offer for PointsCentric readers only. The AA offer is only valid through September 1st and after that time will drop down to 2,500 miles until September 10th. New customers must signup via my referral link here (full disclaimer: I do receive a small amount of miles for each person who signs up and completes a booking). Note: The website will initially show 2,500 miles as your offer – I am working on having the landing page show the special AA offer. If you do not meet the above criteria, such as wanting to earn United miles or the tee time is less than $30, you would earn 2,500 miles. I recommend reading my previous post about Golfmiles but their website aggregates local tee times at golf courses and awards an amount of miles each time you book a round of golf through them. I have generally seen the miles awarded per round range from 250-2,300 miles though with this signup bonus offer, you could earn 3,250 to 5,300 AA miles for one round of golf. The value of these miles could be worth more than the cost of your round of golf! You can also choose to earn a gift card to use towards future rounds of golf instead of miles. Through my research, I found Golfmiles offered the same or even some lower prices than my local courses. I’ve had several readers book through them without any issues and they all earned thousands of miles for playing a round of golf they would have played anyway. I encourage you to give them a try with the knowledge that this offer is the best ever offer for Golfmiles. The public signup bonus is only 1,500 miles and no other blogger has a better current offer. If you have any questions or concerns, please post them in the comments or email me at ralph@pointscentric.com and I can assist in having Golfmiles address it if I can’t answer it.